A loan of $10,000 helped to repair smoke damage, replace my inventory, and gain working capital for my business. I was born and raised in Oakland, Ca. Growing up in Oakland what stood out the most to me was how important it was to establish your individuality by your independent hustle. This had the biggest impact on my desire to start my own clothing line and own and operate my own business. Today I am proud to say that the influence of my city has helped to build my character and growing my business to one of the top 5 places to shop in Oakland for urban fashion. My dream is to make Threadz Culture and Fashion the number 1 worldwide Urban Fashion retail store with both High Class fashion and affordable prices for men, woman and children. It helps an Oakland native entrepreneur repair store damages and get his business back on track. Threadz Culture and Fashion was established in September 24, 2016. In Oakland,Ca by Chris McMichael and Maurion Gaines. During the first year of business our biggest challenge was obtaining vendors of urban fashion, minimum marketing strategies, and establishing ourselves in the community. With the word of mouth of our customers , yelp reviews, online presence, custom made clothing on the spot, and social media. 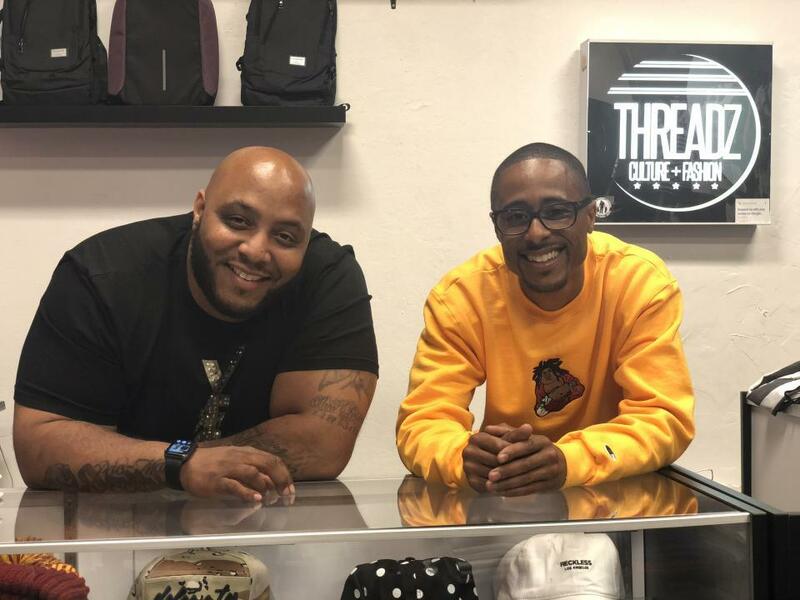 Threadz Culture and Fashion seemingly overnight was established as the go to retail clothing store for exclusive urban fashion. Our mission at Threadz Culture + Fashion is to offer exclusive urban streetwear that follows generational trends in urban fashion. We provide multiple selling platforms for local designers, and also design personalized clothing garments, stickers, window decals and help our community to learn financial literacy. Since opening the doors at Threadz Culture and Fashion, we are most proud of the impact that we have made in Fairfax Business District 4. We are proud to say that we are A+ accredited by BBB . Nominated for an Indi Award at the Oakland Museum, Awarded local Hero's by Oaklands Vice Mayor Campbell, Certified Entrepreneurs In Residency, employ local youth and Chris McMichael was giving the position of Chairman of the Community Development Program. I am asking for a Kiva loan to help us restore our retail clothing store due to smoke damage caused by fire. We expect that this loan will help us get Threadz Culture and Fashion back in order of daily operations. This loan will help to impact our store with new exclusive inventory and also continue to help the local community youth, who depends on us for employment and financial literacy. This loan will impact my family by allowing us to get our business back on track, generate income to support my family and create a legacy. Why are you endorsing Christopher? Chris has stood up a hugely successful business in a short time. He's done that by being a generous leader within the community, as well as showing his hustle by getting entrepreneurship training and support. He has created more than a store -- it's a center of creativity, community and neighborhood youth employment. I've met him several times since I've been Mayor, most recently at the annual Melrose Block Party, where he clearly is loved by all and his store is THE thriving center of a neighborhood commercial area. His store is a critical force in helping this whole neighborhood commercial district come back to a thriving district. This is just the type of entrepreneur and neighborhood story that deserves our support. We shouldn't allow this unforeseen fire derail such a positive force for our community. I will be personally loaning funds to Threadz and I urge you to as well!